WhatsApp is a multi-platform application which enables iOS, Android, Symbian, BlackBerry as well as Windows Phone users to keep in contact with family, friends or colleagues via sending texts, videos, pictures, audio, geographical information, etc. Sometimes it may drive you mad if you loss these funny or important messages as the result of freeing memory or typing the wrong option. 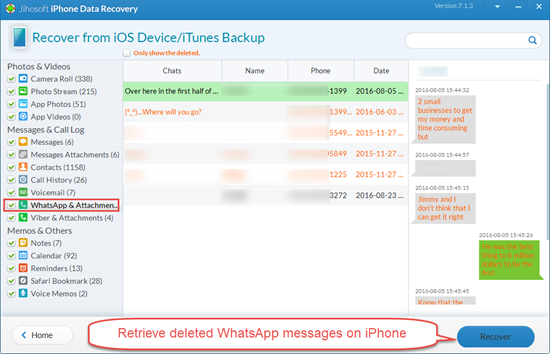 Never fear, we have supplied some quick ways to recover iPhone whatsApp messages from/without Backup. 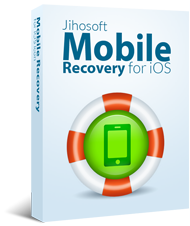 To restore deleted whatsApp messages directly from iPhone, you’ll need an iPhone Data Recovery that enables you to recover lost contacts, text messages, photos, videos, notes, WhatsApp, Viber, etc from iPhone, iPad or iPod Touch. 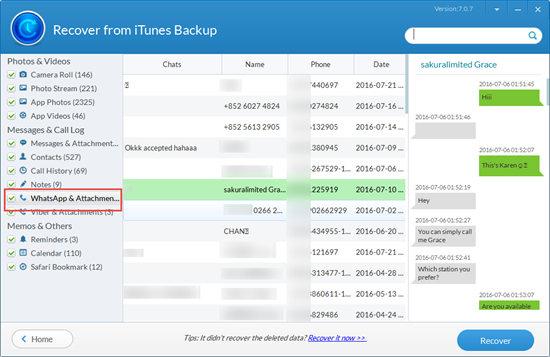 If you have synced your device with iTunes previously, iPhone Backup Extractor is the best choice for you to get back the data. It is a standalone program. You do not even need to connect iPhone to computer as this program is powerful enough to extract data from iPhone backup, including whatsApp messages, viber, contacts, sms, photos, videos, notes, etc. Note: This iPhone Backup Extractor works on most iOS and iTunes versions, including the lastest version of iOS 10 and iTune 12.5.3. As a trusty online back-up option, iCloud offers up to 5GB of free online storage. According to the survey that over 80% iOS users backup their iPhone/iPad via Cloud. Go to Settings -> iCloud -> iCloud Drive to allow WhatsApp to store Documents & Data in iCloud. Now go to WhatsApp Settings -> Chat Settings -> Chat Backup to backup chat history. 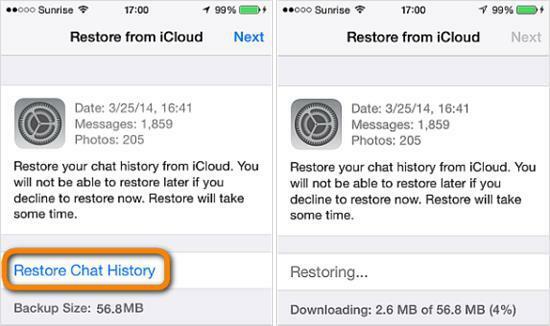 Uninstall and reinstall WhatsApp then restore whatsApp messages from iCloud backup.